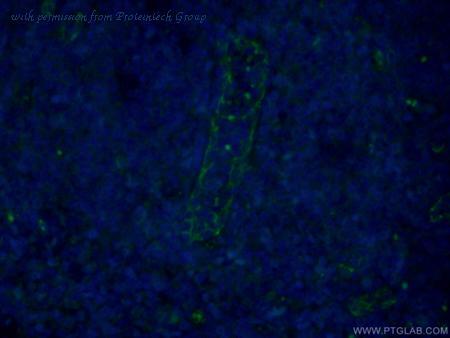 Formalin-fixed, paraffin-embedded human tonsil stained with CD31 antibody using peroxidase-conjugate and AEC chromogen. 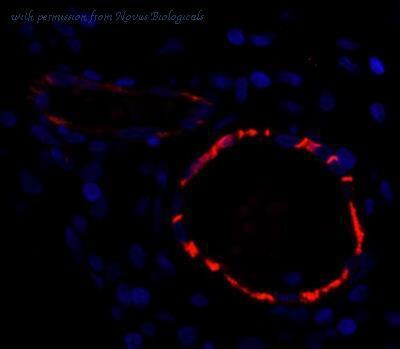 Note cell membrane staining of endothelial cells. 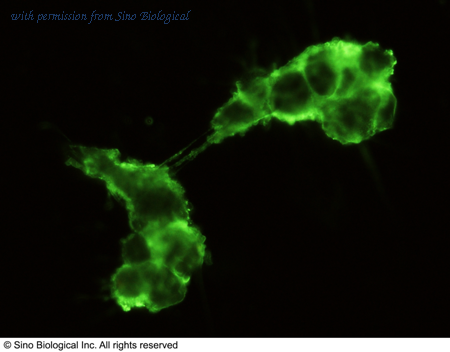 The monoclonal antibody clone SZ31 reacts specifically with endothelial cells in vessels and capillaries of (among others) mouse small intestine. 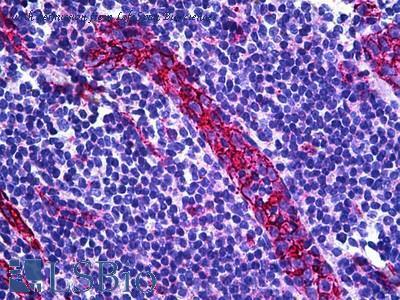 The monoclonal antibody clone SZ31 reacts specifically with endothelial cells in vessels and capillaries of (among others) mouse liver. 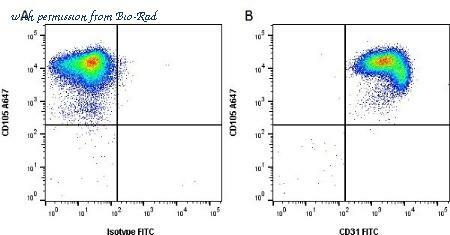 Immunoblot of extracts from murine lung, J558L cells and m-Lend cells using CD31 rat monoclonal antibody clone SZ31. 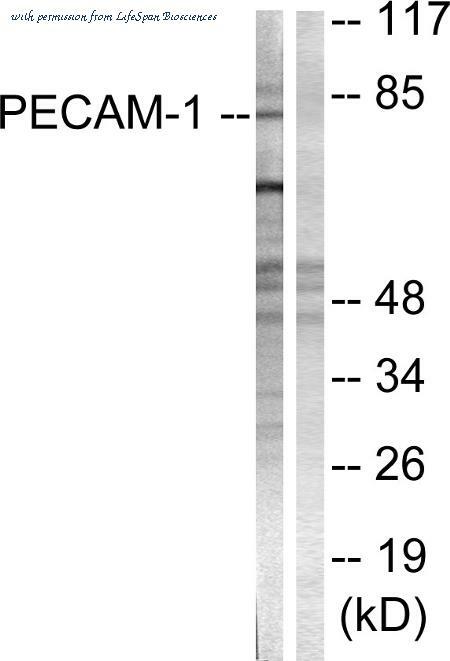 Detection of Human CD31/PECAM-1 by Western Blot. 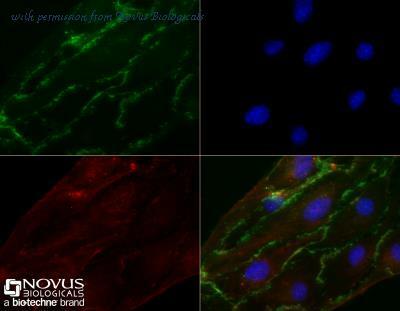 Western blot shows lysates of HUVEC human umbilical vein endothelial cells. 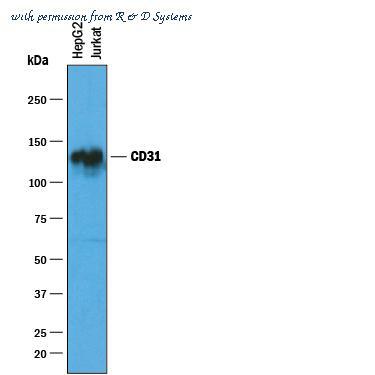 PVDF membrane was probed with 1 ╡g/mL of Mouse Anti-Human CD31/PECAM-1 Monoclonal Antibody (Catalog # BBA7) followed by HRP-conjugated Anti-Mouse IgG Secondary Antibody (Catalog # HAF018 ). 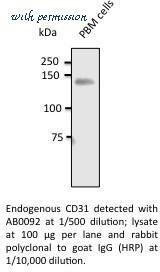 A specific band was detected for CD31/PECAM-1 at approximately 130 kDa (as indicated). This experiment was conducted under reducing conditions and using Immunoblot Buffer Group 1 . 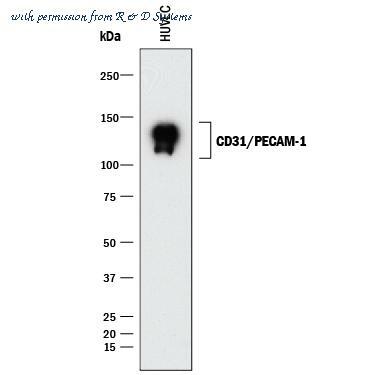 Detection of Human CD31/PECAM-1 by Western Blot. Western blot shows lysates of HepG2 human hepatocellular carcinoma cell line. 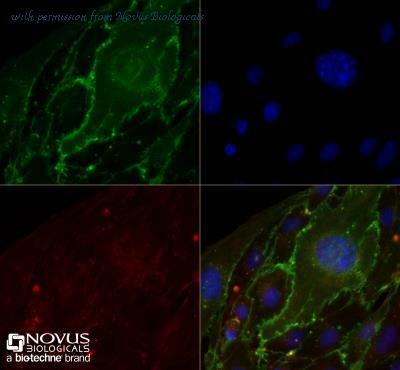 PVDF membrane was probed with 1 ╡g/mL of Sheep Anti-Human CD31/PECAM-1 Antigen Affinity-purified Polyclonal Antibody (Catalog # AF806) followed by HRP-conjugated Anti-Goat IgG Secondary Antibody (Catalog # HAF019 ). 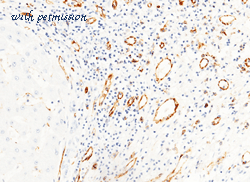 A specific band was detected for CD31/PECAM-1 at approximately 130 kDa (as indicated). This experiment was conducted under reducing conditions and using Immunoblot Buffer Group 1 . 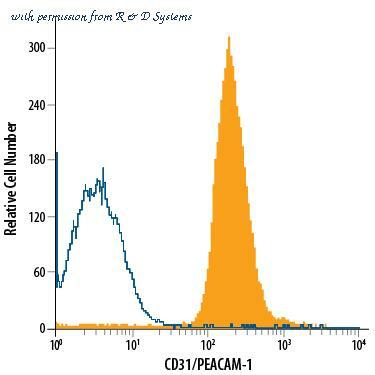 Detection of CD31/PECAM-1 in Human Granulocytes by Flow Cytometry. 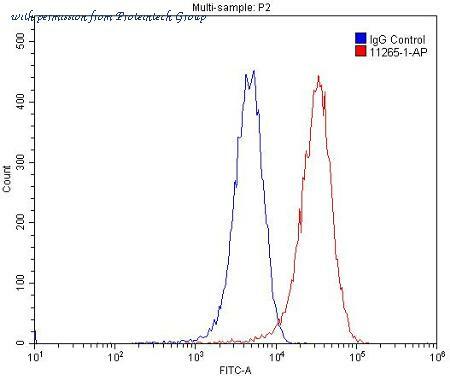 Human peripheral blood granulocytes were stained with Mouse Anti-Human CD31/PECAM-1 PE-conjugated Monoclonal Antibody (Catalog # FAB3567P, filled histogram) or isotype control antibody (Catalog # IC002P, open histogram). 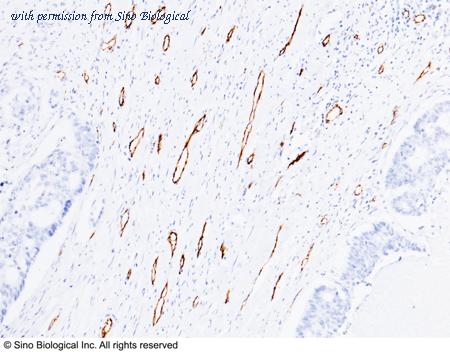 View our protocol for Staining Membrane-associated Proteins . 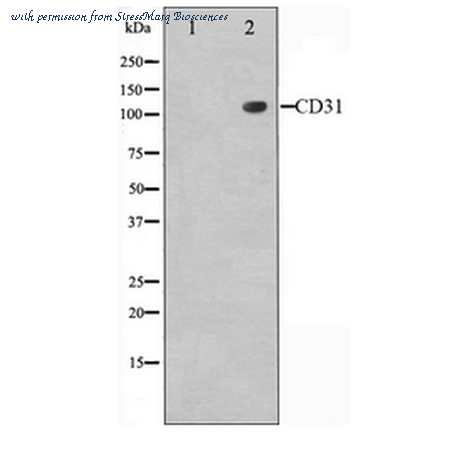 The CD31 antibody from Proteintech is a mouse monoclonal antibody to a fusion protein of human CD31. This antibody recognizes human antigen. 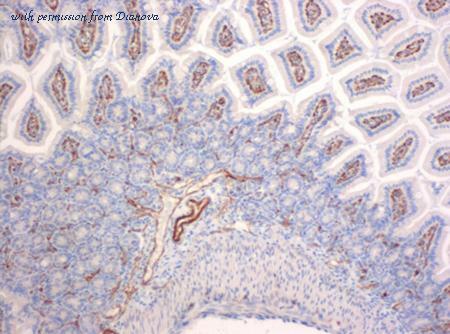 The CD31 antibody has been validated for the following applications: ELISA, WB, IHC, IF analysis. 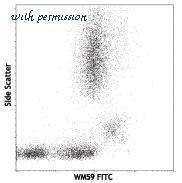 Human peripheral blood lymphocytes, monocytes and granulocytes stained with purified WM59, then detected with anti-mouse IgG FITC. 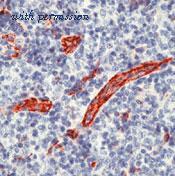 Anti-CD31 antibody IHC of human tonsil, vessel. Immunohistochemistry of formalin-fixed, paraffin-embedded tissue after heat-induced antigen retrieval. 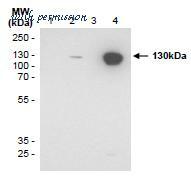 Antibody dilution 1:100. 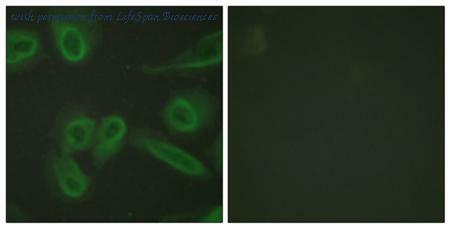 Immunofluorescence analysis of HeLa cells, using PECAM-1 Antibody. The picture on the right is blocked with the synthesized peptide. Western blot analysis of lysates from Jurkat cells, using PECAM-1 Antibody. The lane on the right is blocked with the synthesized peptide. Figure A. Alexa Fluor 647 conjugated Mouse anti Human CD105 ( MCA1557A647 ) and FITC conjugated Mouse IgG1 isotype control ( MCA928F ). Figure B. Alexa Fluor 647 conjugated Mouse anti Human CD105 ( MCA1557A647 ) and FITC conjugated Mouse anti Human CD31 (MCA1738F). All experiments performed on HUVEC cells gated on live single cells in the presence of 10% human serum. Data acquired on the ZE5 Cell Analyzer. 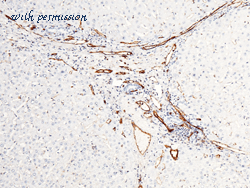 Detection of Human CD31 by Immunohistochemistry. Sample: FFPE section of human colon adenocarcinoma . 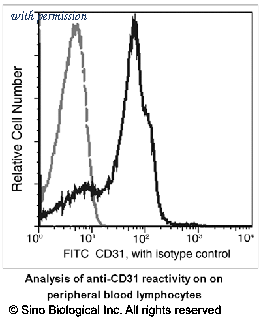 Antibody: Affinity purified rabbit anti-CD31 (Cat. No. IHC-00055) used at a dilution of 1:250. Detection: DAB. 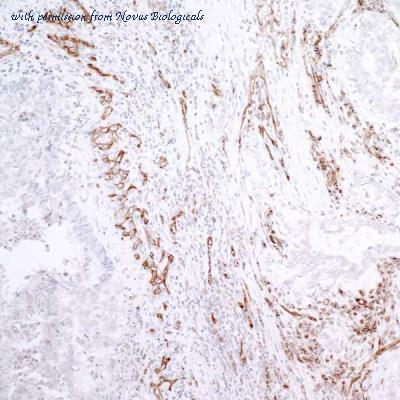 Immunochemical Staining of human CD31 in human mammary gland with Mouse Monoclonal Antibody (15 µg/mL, formalin-fixed paraffin embedded sections). 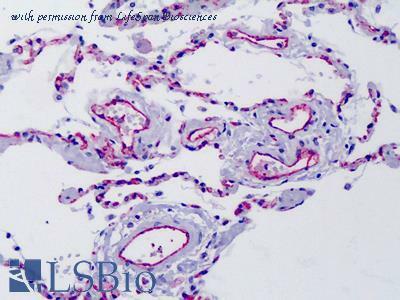 Positive staining was localized to vascular endothelial cells. 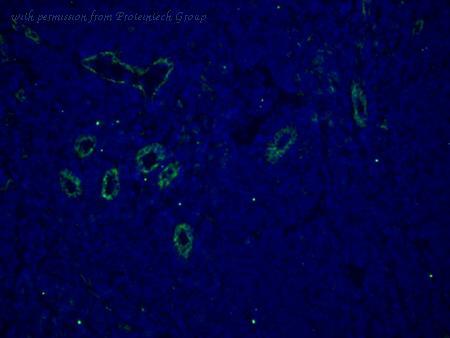 Immunochemical Staining of human CD31 in human liver with Mouse Monoclonal Antibody (15 µg/mL, formalin-fixed paraffin embedded sections). 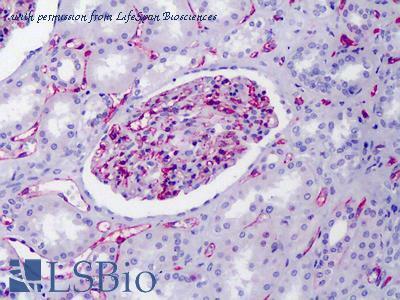 Positive staining was localized to vascular endothelial cells. 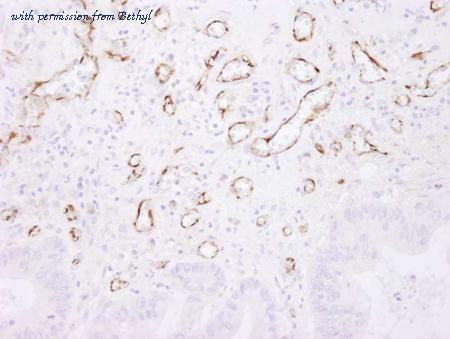 Immunochemical staining of human CD31 in human mesenteric tumor with rabbit monoclonal antibody (5 µg/mL, formalin-fixed paraffin embedded sections). Positive staining was localized to vascular endothelial cells. 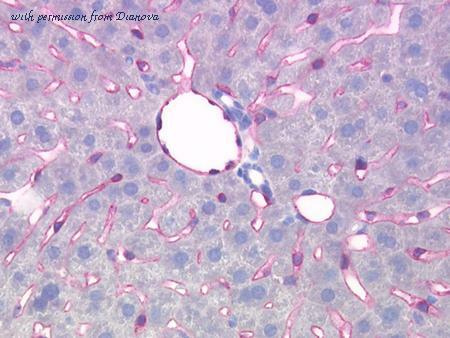 Immunochemical staining of human CD31 in human liver with rabbit monoclonal antibody (5 µg/mL, formalin-fixed paraffin embedded sections). 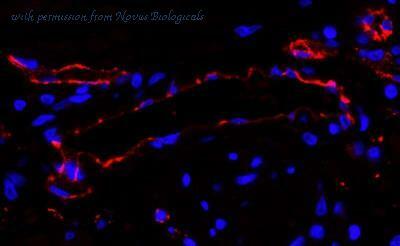 Positive staining was localized to vascular endothelial cells. 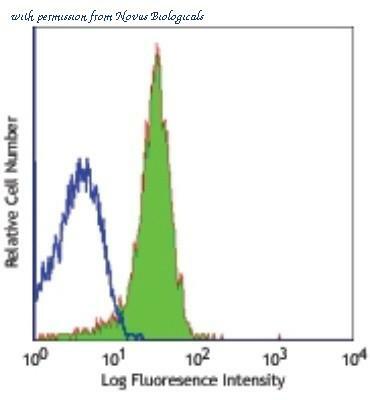 Profile of peripheral blood lymphocytes and blood monocytes analyzed by flow cytometry.